West Bend has been a leader in developing electric kitchen appliances since being founded in West Bend, Wisconsin in 1911. Providing unmatched performance, quality and value to consumers has always been at the heart of everything we do. Popcorn is a delicious and healthy way to enjoy snack time. You can eat it plain for a healthier snack or indulge with butter and seasonings. It can be dressed up or dressed down for any occasion. It is the perfect addition to any dinner party, backyard BBQ or winter's night in front of the fire. 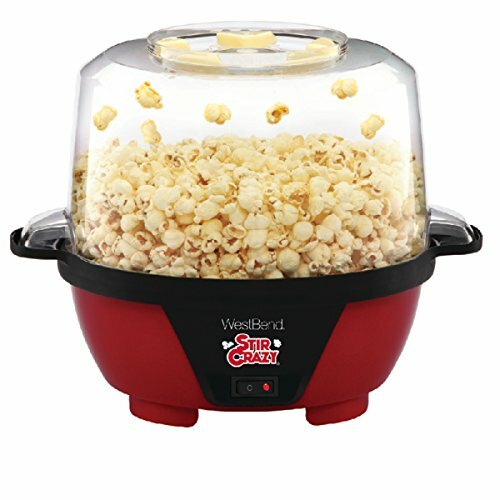 The Stir Crazy No.82505, 6-Quart Popcorn Popper by West Bend is America's favorite popcorn popper. It measures 13" W x 10" L x 10" H and is constructed of durable and BPA free plastic housing. The Stir Crazy uses a triple-layer heating plate which increases performance and insulates the body of the popper to fully pop up to 6.75-quarts of popcorn in about 4 minutes. Features of the Stir Crazy popcorn popper include the clear cover which not only allows you to see the popcorn pop, but also transforms into a family-sized serving bowl when popping is complete. Atop the cover is a butter well- butter placed in the butter well will melt from the heat of the popper and drizzle onto the popcorn as it pops. When popping has finished, simply snap the butter lid over the butter well, flip the machine upside down and the cover is now a serving bowl for your snack. The easy-to-read ON/OFF button of the Stir Crazy activates the heating surface and rotation of the stirring rods. The stirring rods keep the corn moving to pop all of the kernels. The compact surface and steep side walls of the heating plate keep kernels centered and yield greater popping efficiency. When finished, the non-stick heating surface is easy to clean and the dual-purpose cover and serving bowl is top-rack dishwasher safe. The permanently attached cord wraps underneath the base and the base nests neatly inside the cover making for a compact, no-tangle storage when not in use.